This paper presents a continuous-flow in-droplet magnetic particle separation in a droplet-based microfluidic device for magnetic bead-based bioassays. Two functions, electrocoalescence and magnetic particle manipulation, are performed in this device. A pair of charging metallic needles is inserted into two aqueous channels of the device. By electrostatic force, two different solutions can be merged to be mixed at a junction of droplet generation. The manipulation of magnetic particles is achieved using an externally applied magnetic field. The magnetic particles are separated by the magnetic field to one side of the droplet and extracted by splitting the droplet into two daughter droplets: one contains the majority of the magnetic particles and the other is almost devoid of magnetic particles. 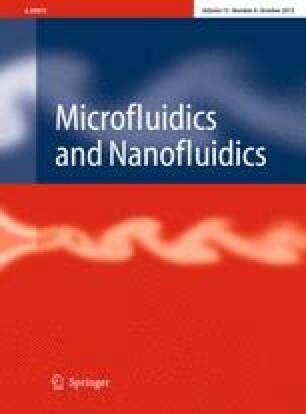 The applicability of the continuous-flow in-droplet magnetic particle separation is demonstrated by performing a proof-of-concept immunoassay between streptavidin-coated magnetic beads and biotin labelled with fluorescence. This approach will be useful for various biological and chemical analyses and compartmentalization of small samples. This work was supported by the National Science Foundation grants (Grant Nos. ECCS-1002255 and ECCS-0736501).